This short segment for our english-speaking visitors show you the very essence of our activity: the Tao-Instruments. 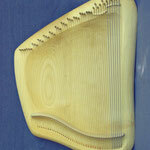 Going back to a lecture given by Dr. Rudolf Steiner in 1924, two inspired man, Lothar Gärtner and Edmund Pracht made the first four string Tao-Lyre, wich was originally a kind of meditative instrument mainly for eurithmists, shortly later through Dr. Ita Wegman it found its way to the healing pedagogy ("Sonnenhof" Arleshein, CH). 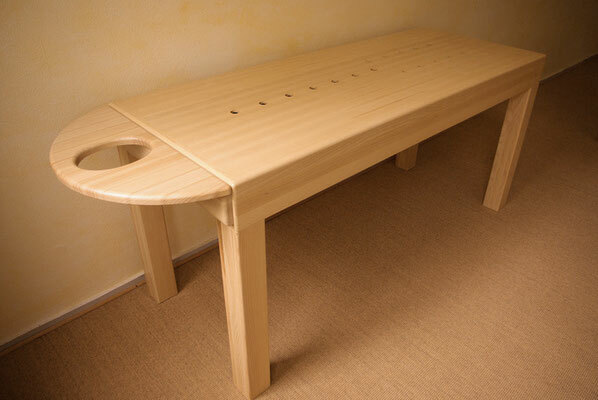 A music scientist, Hermann Pfrogner devoted a short but important writing on the Tao-sounds, meanwhile Heinz Heinrich Engel, a medical doctor made a kind of school in Switzerland for working with these special musical scale. 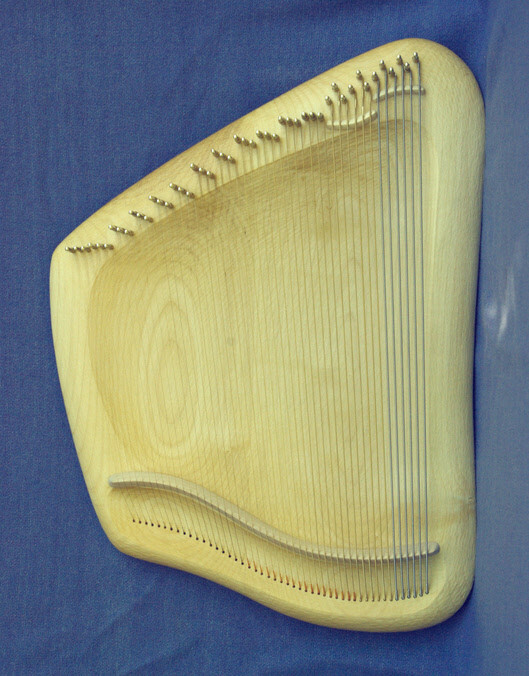 After several decades of intern but intense work with this four-note-scale and its diverse derivatives, a student of Maria Schüppel, who was the actual founder of the anthroposophic music therapy school in Berlin, Victoria Ryan, a music therapist and healing pedagogue in Vienna mandated in the nineties the music instrument maker Andreas Lehmann in Germany, to make the first, three octave so called "Tao-Lyre". Robert Benedek in the early 2000s getting contacted with and helped by Lehmann, he then started his own career and fertilized the new Tao-impulse with the specific vibro-acoustic application of the Tao-Lyra. 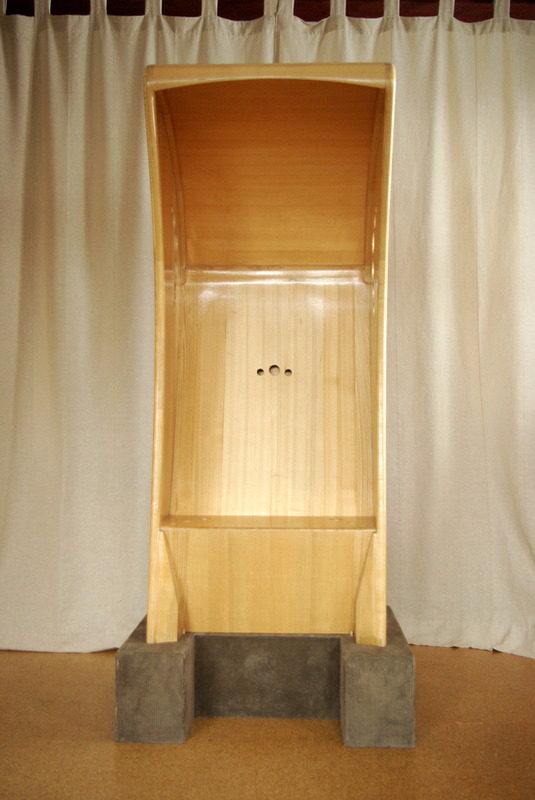 In a several year of intuitive-artistic research periode Robert Benedek developed not only his own method of playing the Tao-Lyra with direct body contact, but he invented new instruments to intensify the Tao-Impact on the human spirit, soul and body (Tao Sound-Bed and Tao Sound-Cabin). 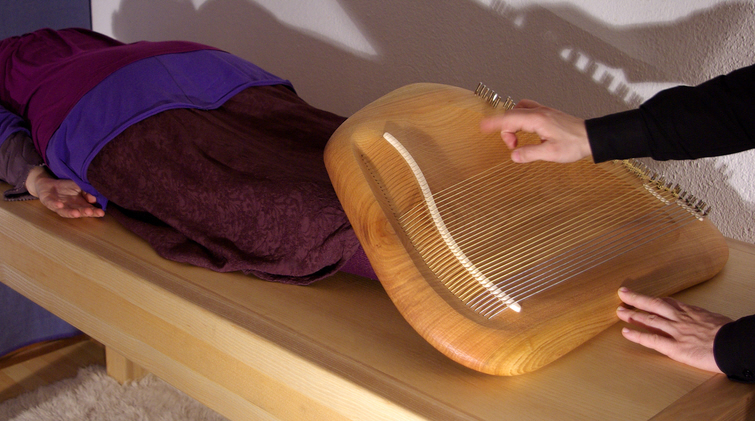 Then this method of resonance-based play of him -through tough resistance and opposition- finally found its way in the anthroposophic medicine: in the Filderklinik (Filderstadt, Germany) and in the Ita Wegman Klinik (Arlesheim, Switzerland) the Tao Sound-Bed are became one of the main healing instruments of the music therapy departments with astounding effects. The results were such, that first in the Ita Wegman Klinik a pilot clinical study with very remarkable data was made, an then on the basis of this, a very serious, four-step clinical study was initiated in the Filderklinik (joint with the Ita Wegman Klinik) wich is now in the final stage and is partly already published and will be the content of a dissertation in The University of Tübingen, Germany. A pilot study with significant results was also made in psychiatric environment in Hungary and a big, serious clinic study in Helsinki with 100 test persons is just right now presented by the initiator Pia Teckenberg Jansson (music therapist). Having been speaking on the language of the science today till now, if we speak on the language of spiritual science, we can formulate, that this very unique tone-sequence has a superb and astonishing effect on the whole human constitution: it brings one in to the body, compressing, warming, energizing it, smooths, harmonizes the soul and open up the spirit- we can call it a kind of archetypal therapeutic state. It looks to have the effect to organize the limbs of the human being -physical body, aetheric body, astral body, I-body, as Dr. R. Steiner systematized it- in an order of original state. This is quasi some kind of archaic and archetypal peak experience of the individuum, of the person: to come in contact with the very inner being of oneself, having a correcting sight on ones live or just being putted in a state of well being, joy and self acceptance: a kind of paradise-experience. Because of this universal feature, the Tao-Instruments can be used very widely -and the are used very widely indeed- in very different fields: pain-therapy in the oncology, breath-therapy: being able to breath again, generally, to give the soul the needed "kick" to go on; to center, to come to oneself, to to get contact with the inner being; in the healing -and kindergarten pedagogy and so on. 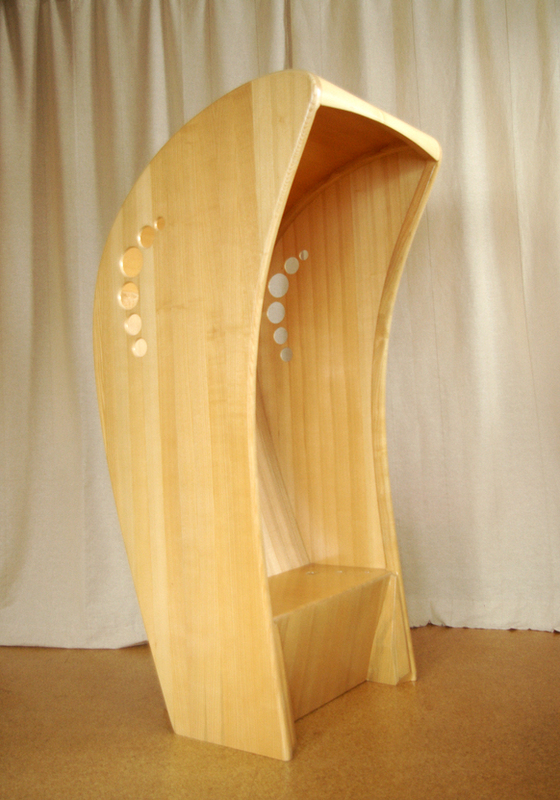 This instrument could be called as a basic one to get contacted with the world of the vibroacoustic Tao. 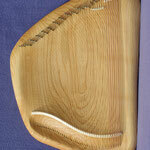 Easy to handle and transport, good value for money, it represents the entrance to this special kind of healing method. Very good complementable with the Tao Sound-Bed, it is your first choice. The main field of use is the classical music therapy praxis, music therapy departments of clinics, facilities of healing pedagogy, in combination with rhythmic massage, but also has its use in the kinesiology and in the humanenergetic. 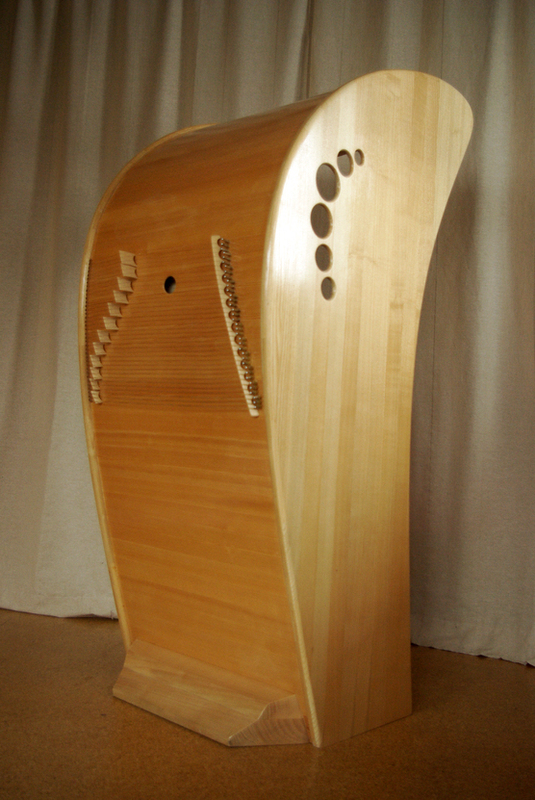 This stationary Instrument is an excellent complement to the Bass Tao-Lyra. It covers the whole body, works generally, not locally has a multiple of resonance effect, can be used to envelope someone in light filled safeguarding warmness. 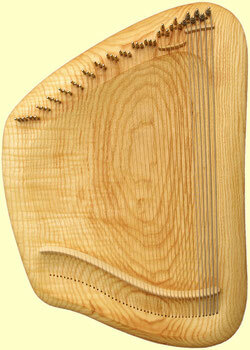 It has an identical tuning like the Bass Tao-Lyra (four octave, 48 strings). 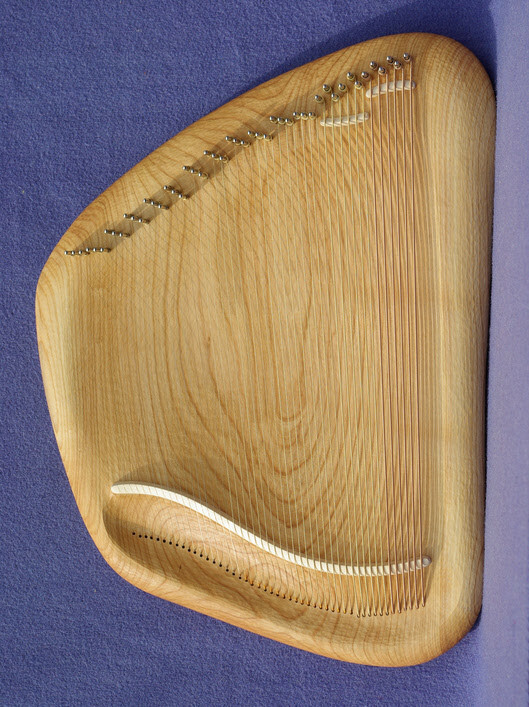 Two of the main anthroposophic clinics, (Ita Wegman Klinik, Arlesheim, Schwitzerland; Filderklinik, Filderstadt, Germany) uses Tao Sound-Bed from us with very remarkable results. 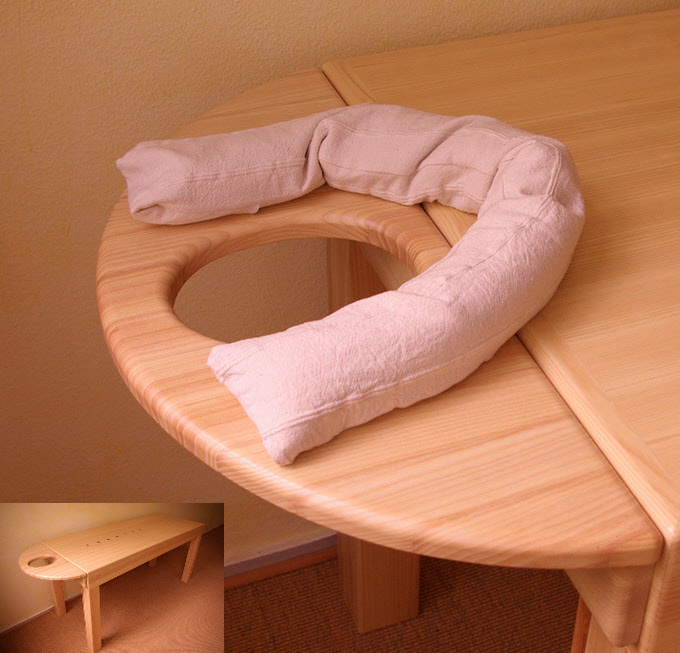 Very telling in this regard, that in Filderklinik the oncology patients themselves organized a second Tao Sound bed from us, so this clinic has now two exemplars of it: one in the psychosomatic and on in the oncology department. 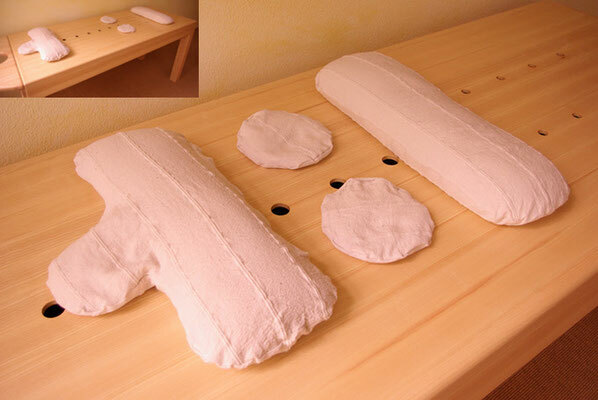 A four step clinical study is now in the last phase of making, but already the pilot study in Ita Wegman Klinik (2011) showed signs of the state of physiological deep relaxation, like during sleep -and this during and even after the treatment. In a large psychiatric facility in Szentgotthárd, Hungary (2011) an other pilot study showed significant relief of anxiety disorder and stress levels by mainly schizophrenic patients. An other remarkable study with 100 test persons, women in endangered pregnancies were also made in the University Clinic in Helsinki, with good and measurable results. So the study material grows, but despite of that, almost everybody who try this kind of treatment feel immediately the effect on every level of their organization, and can only express themselves in superlatives, like a medical doctor put it in this way: "a sense of body consciousness i never ever experienced before." 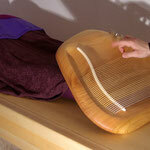 Mindfulness, centering, being by itself, deep relief in soul and body, spiritual presence and a sensation of a protecting sheet around oneself are the main characteristics of this wonderful instrument. The best way to contact us is via email (r.benedek@aeterherz.de) -if you don´t get any answer, it could mean, our spam filter malfunctioned (it happens very rarely), please do contact us via phone then (+49 174 826 4814). You can use our contact-form too: click the "Kontakt" button on the left side. Your order is binding after receiving your payment (payment in advance or prepayment), then you get a confirmation email from us and you will be also informed about the approximate date of shipping. Please notice, that the queuing of the orders are carried out by the chronological order of the payments. 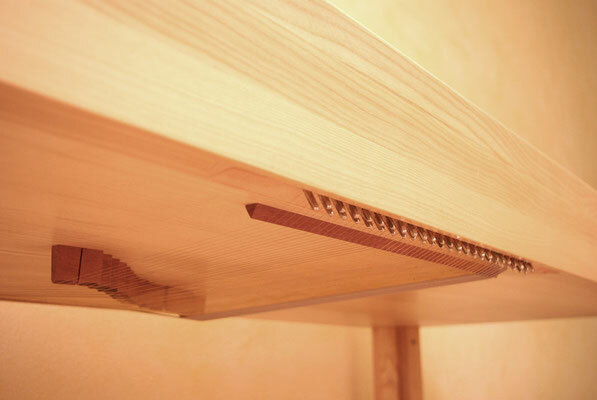 The lenght of time for building an instrument can vary quite widely: in case of the Tao-Lyra from 2 up to 8 weeks, in case of the Tao Sound-Bed from 4 up to 12 weeks depending on our workload, the period of the year and so on.